I can’t find the charger for my camera. The camera on my new smartphone* is apparently only slightly worse than my Nikon, but I am enough of a Luddite** to cling to it anyway. 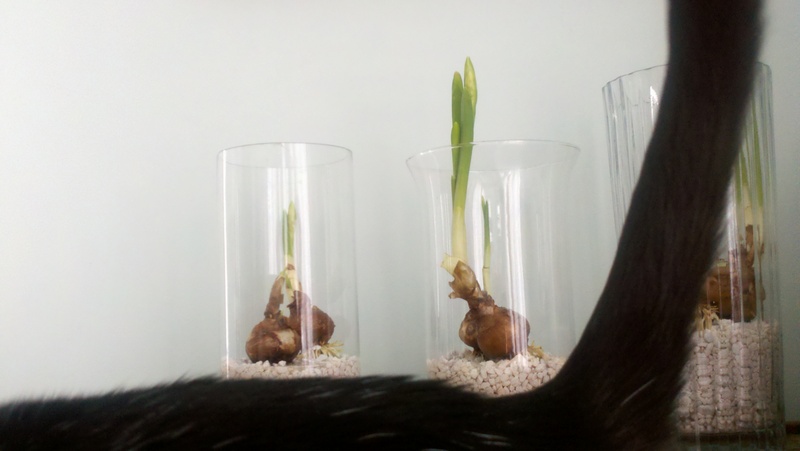 I was going to take pictures of the growth of these paperwhite bulbs, but they’re moving too quickly. I planted them only last week, but I could swear that they slither up another centimeter or so each time I leave the room. I had a few pictures without Puck’s tail. Since none of them were very good, though, I just went with it. Paperwhites are pleasing (though I find the scent of the blossoms in full bloom a bit too much to bear). Other winter whites I’m liking: the quilt on my bed, the baskets and towels in my newly-reorganized hall closet, and the snow that’s falling right now. The world had gotten a bit gray and ugly after an unseasonable thaw and I really don’t want to look at the state of my lawn right now (I should have thrown those pumpkins away before they froze to the ground). *I tried to resist, but buy-one, get-one-free Androids proved too great a temptation. I am now a much more boring person. **I am fascinated by the literal, loom-smashing meaning of that term (hence the capitalization). I like how you don’t know how to use footnotes in your diss, but use them to great effect on your blog. The pic of Puck’s tail is kind of obscene, yes?